Flow chamber device in Exo Mars 2020 project. Potential applications in probing the health of machines and automobiles. Bio-sensing, pattern recognition and image processing. Photo stress sensing, microscopy measurement and multi-scale simulation in Engineering. Infrared tomography to detect early damages at micro scale. Measuring displacement fields in granular systems. Advanced liquid systems – Nano fluids. Improving energy capturing and management. The seminar proceeded with lots of stimulating questions and ended up with great learning experience for the attendees. 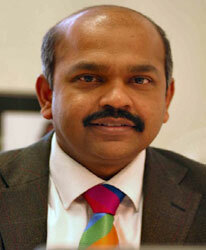 Dr Antony is an Associate Professor at the School of Chemical and Process Engineering, University of Leeds. His primary research interest lies in the area of Particulate Mechanics and Physics, especially on the bulk behaviour of powders and grain under industrial process conditions as a function of particle-scale properties. He uses wide range of computational tools such as DEM, FEM, theoretical and experimental procedures in his research. He is a proud recipient of the prestigious ‘MIT Young Researcher Fellowship Award for Exemplary Research in Computational Mechanics’. He has made several publications in reputed international journals and conference proceedings. And serves as a member of editorial boards for many international journals in his filed including Journal of Nanotechnology and Research Letters in Nano Technology. He has also served as a guest editor for the Jl. Granular Matter and the lead editor of the book ‘Granular Materials: Fundamentals and Applications’, published by the Royal Society of Chemistry, London in 2004. His biography is included in the Edition of Marquis Who's Who in the World and the Directory of International Biography Centre, Cambridge.